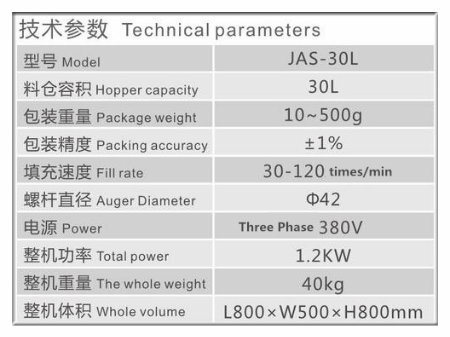 1,Adapt to the measurement of a variety of materials such as ultrafine powder to fine particles,etc. 2,The material box can be easily washedÂ without tools. 3,All 304 stainless steel structure. 4,Equipped with highly adjustable handwheel to adjust the height of the whole machine. 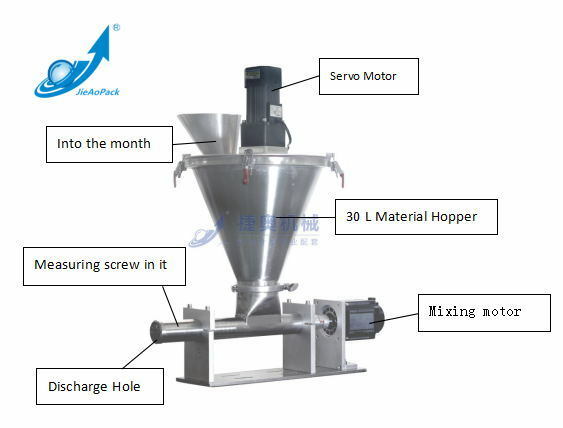 Â Â Â Â Â The machine is specially designed and manufactured for powder, ultrafine powder and other materials, and can automatically complete the work of metering, filling and filling nitrogen. It can be matched with all kinds of bag making packer for filling powder material. It is suitable for packaging those powder and granular materials with poor mobility or poor mobility, such as milk powder, feed, rice flour, sugar, monosodium glutamate, solid beverage, glucose, rice noodles, food additives, nutritious food, dyestuffs, flavors and fragrances. 1. The whole machine is made of stainless steel. It is especially suitable for GMP certification, food hygiene certification, and corrosion resistant chemical products packaging. 2. The unique mechanical transmission mode is adopted to make the structure simple, stable and overloaded. 3. Filling servl electrical motor spiral, has the advantages of accurate positioning, high accuracy, high speed, high torque, long service life, good stability, speed can be set. 4. Stirred by platform production free maintenance reduction motor: low noise, long life, life-long maintenance free. 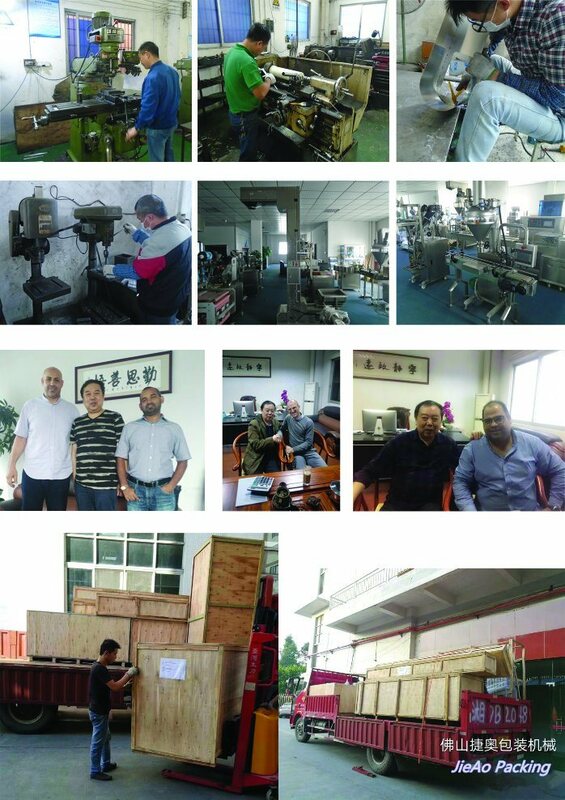 Â Â Â Â Â Â FoShan JieAo Packaging Machinery Co., Ltd. is the highest cost performance company in China for the field of screw dosing machine. JieAo has focused on the design and manufacture for powder dosing, screw feeding and the material transfer for more than 15 years. 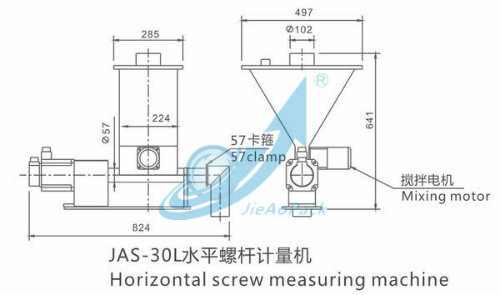 JieAo has more than 20 models for screw dosing machines and vibrating screw feeders. We focus on sub-supplying the vertical packaging machine, bags packaging machine, oriental packaging machine and all kinds can filling machine for powder to the packaging machinery manufacture. Our equipment is widly used in the field of food, chemical, agricultural chemical, daily used chemical and metallurgy. Q1: What kind of material is this machine made of ? Q2: What is the warranty for this machine? A2: One year free for replacement of wearing parts, cost price beyond warranty. Q3: What's your trade terms? A4: Usually 15-30Â days, depends on order quantity. A5: T/T 50% deposit, 50% balance before delivery. Q6: What's the packing of this machine? A6: Bubble film wrapping inside, Non fumigated wooden case outside. A7: By sea, by air,Â by railway or by truck, according to customer'sÂ requirement. Q8: Why to choose JieAo? A8: We have 15 years of manufacture experience!Â The process of the surface treatment and appearance is originally from Germany.We focuse on quality and achieve the top class of result.